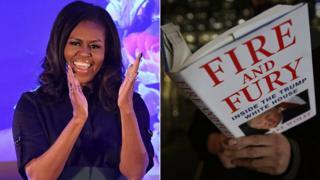 This year's British Book Awards is dominated by two US heavyweights: former First Lady Michelle Obama and President Donald Trump. Obama's memoir, Becoming, goes head to head with Michael Wolff's White House exposé Fire and Fury in the narrative non-fiction category. There are eight categories from which the book of the year will be chosen, with the winner announced on 13 May. Obama's book is also nominated in the audiobook category. The audiobook shortlist also features Anna Burns' Milkman, which won last year's Booker Prize and will also compete for the fiction book prize. Sally Rooney's novel Normal People, Waterstones' book of 2018, is also on the fiction shortlist. Paddington star Ben Whishaw narrates another audiobook nominee, Stephen Hawking's Brief Answers to the Big Questions. Heather Morris's The Tattooist of Auschwitz is up for best debut. It tells the true story of Ludwig 'Lale' Eisenberg, who had to tattoo serial numbers on the arms of his fellow prisoners. David Walliams and Jacqueline Wilson feature on the children's book shortlist, as does Tomi Adeyemi for her debut Children of Blood and Bone. It's the second nomination for Adeyemi in two days. The US writer was also nominated for Waterstones' Children's Book Prize on Thursday. But there is tough competition from Hilary McKay's The Skylarks' War, which won the Costa children's book prize earlier this year. The awards, dubbed the Nibbies, are organised by trade magazine The Bookseller. Each of the eight categories has its own judging panel. A separate panel, whose members include Labour MP Jess Phillips and Sky News' Kay Burley, will go on to choose the overall book of the year. The Mueller report is here - what next?